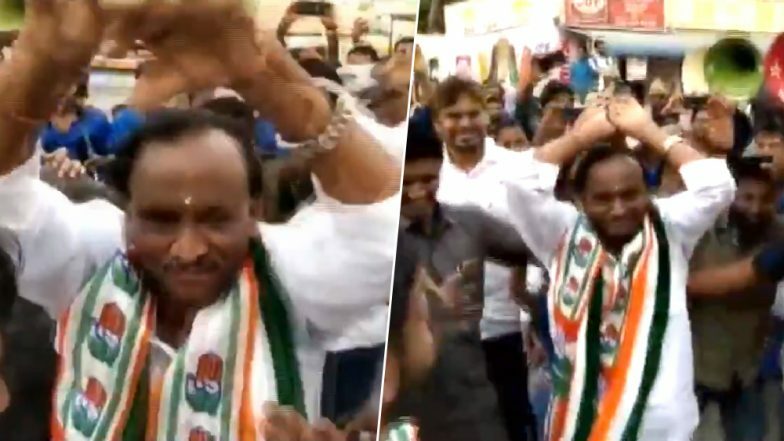 While campaigning for Lok Sabha Elections 2019, in a bid to woo voters, Karnataka Housing minister MTB Nagaraj danced to a popular song from 1954 Hindi movie Nagin. He joined a group of dancers in Hoskote and matched steps to the song "Mann dole mera tan dole", matching the rhythm with drummers. The video of the minister's dance performance has now gone viral on social media. And we can't help but think of how Nagaraj, whose name means King Cobra danced to Nagin music which also refers to snakes. Nagaraj who is known as MTB by his supporters was seeking votes for Congress candidate and former union minister Veerappa Moily who is contesting from the Chikkaballapura Lok Sabha constituency on Tuesday in Katigenahalli village, when he showed off his dance moves. A live band was following the minister's convoy and as soon as they played the song, the 67-year-old couldn't help but groove. As soon as he began to dance, his supporters also danced along with him. The entire performance went on for about 10 minutes. Dancing Voter From Bandipora in Jammu and Kashmir is Winning Hearts on Social Media Amid Phase I Voting For Lok Sabha Elections 2019; Watch Video. Eventually, Nagaraj was asked to slow down considering his age. And don't you think that the minister had saved his antics for the election campaigning alone, he has shown off his dance moves in the past too. Last year, MTB was ranked as the richest legislator in the country by the Association for Democratic Reforms, an NGO. They had stated that the assets were valued at over Rs. 1,000 crores. Karnataka will vote in two phases on April 18 and 23.